CEO video in minutes. - nexxar lab. - nexxar lab. How to create a great CEO video with only 30 minutes of shooting time. Good CEO videos are hard to find in online annual reports. Partly because the CEO often only has little time on the actual shooting date. But is it possible to create a great CEO video with only 30 minutes of actual shooting time? We say it is – if you invest enough time in the preparation. Control of the narrative: Companies can better introduce themselves to internal and external stakeholders. This is even more important in fact-driven publications, such as annual reports. Videos can transport emotion and complement the overall CEO communication. 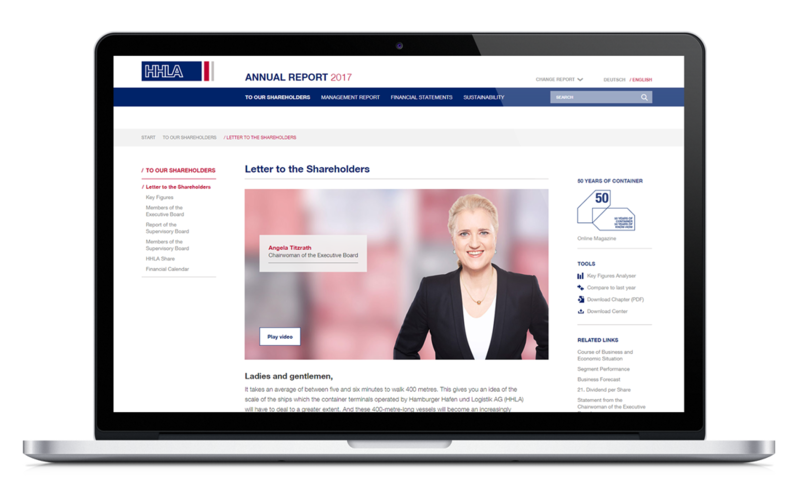 Increased authenticity: The multimedia presence of the CEO in the annual report will add authenticity to the classic board letter. Stakeholders associate CEOs directly with the business success of a company. In times of crisis, CEOs with a good reputation are given more confidence. Appreciation of the viewer: Furthermore, CEO videos are a statement of appreciation for a corporate report and its readers – because the CEO takes their time, to personally address the stakeholders. No photo or board letter could ever address stakeholders with such a personal touch. Emotion: Speaking of personal touch … let’s talk about emotion. After all, we are human beings and we just prefer to learn from other people rather than just reading something. Digital distribution: Finally, the possibilities for the digital distribution are far bigger with the use of videos. Now that the “why” is clear, let’s move on with the “how”. You may know the situation from previous CEO video shootings: Your CEO comes in, has only little time, they want to quickly sit down, do three takes and be done with everything. This is where the good preparation comes in very handy. That means, for example, to prepare the whole setting for the shoot: Light, camera, sound-check, teleprompter, make-up and so on. Everything should be tested and prepared down to the very last detail: Use a stand-in to find the perfect frame, test the light, and find the perfect height for the camera and teleprompter. If needed, prepare video animations in advance, select the background music and test the colour grading. You could even do a complete test run and shoot und cut the whole video weeks ahead. Without concept and – most importantly – content, there is no video. So, this might be the most obvious point, but it is still worth mentioning, as it is one of the biggest parts of the preparations. At the end of the conception phase, the presented information for the video should be clearly defined, including script and storyboard. Trust us: In most cases there won’t be more than 30 minutes of actual shooting time with the CEO. This will be enough time to shoot 3, 4 or maximum 5 takes, which will offer quite a bit of useful material, if there has been enough time for the preparations beforehand. The more time is invested in advance to take every detail into consideration (including concept, script, location, equipment, sound and video setting, outfit and make-up), the better results you will get. By the way: The language of the video is also a factor that will influence the time needed for the shooting. If your German CEO speaks English very well, why not shoot the video in English only and provide German subtitles? The success of a video shoot depends very much on the chosen location and the local (light) conditions. There are different kinds of video settings – a studio setup might be the safe choice, but of course, not the most exciting one. Anyways, whether the video shoot takes place indoors or outdoors, whether you have natural or artificial light is very relevant information that will influence your whole planning (e.g. equipment). So, obviously, a lot of research is needed here: How is the light at the time of day when the video shoot is planned? What could be possible disturbances, e.g. for the sound? Are there enough power sources? Before deciding on the location, it is important to see it first, even if only on photographs, and to consider all these questions ahead of time. One question clients often ask, is about the ideal video length for a CEO video. We believe that it is good to make the message as much to-the-point as possible. It really is best if the CEO video does not exceed 1.5 minutes in length and even less for social media. Just have a look at the best practice examples below and decide for yourself which ones are more appealing. Regarding the video format, it is very important to think about where and how to use the video, before creating it. Needless to say, a CEO video should be implemented not only in the online annual report, but also on the corporate website, on the intranet and on YouTube, Facebook etc. This is also an important argument, when you discuss the budget of a video internally. The CEO message can have a crossmedia effect: It can be published on different communication channels at the same time (not only within the annual report). However, the different platforms must be taken into consideration before producing the video, as this will result in different requirements for the design, because different output formats may be needed. One possibility is to prepare only small teasers, with just one question and answer, to be shared via social media. Apart from the CEO letter, it is also a good idea to place the CEO video on the report’s landing page, where it will get a lot of attention. By using a common video player such as YouTube or Vimeo, we can be sure that the player works on almost all devices and browsers. And then, a good video is not enough: In the online report, the video will also need an appealing preview image that arouses interest. In terms of usability, it is always better to refrain from autoplay, that’s why it is even more important to attract the user’s attention to click on play. Lastly, you will need to define what happens after the video is finished – a call-to-action with a link to the CEO letter or to a key figures overview would be an option here. There’s a saying that there is no second chance for the first impression. Well, the same thing applies to videos: If you watch a video, the first few seconds of the video will be enough for you to decide whether you want to continue watching or not. Therefore, these seconds should be as exciting as possible, for example, with an interesting question or a surprising statement by the CEO. Have a look at these three CEO videos and decide for yourself which of the three you would like to continue watching: (1) HHLA CEO video, (2) Solvay CEO video (3) Aareal Bank CEO video? The three videos mentioned above are examples of videos where CEOs address the viewers directly (looking straight into the camera), sometimes accompanied by animated key figures and additional video footage. We have selected a quite a few examples, following this and other concepts. Take a look below to find out more about the different settings for CEO videos. Echo Investment Annual Report 2017: The CEO video from ECHO Investment has an interesting and easy-to-implement video setting, different camera perspectives and a nicely done teaser on the landing page. However, the background music is missing, the animations could have been improved and once you click on the teaser image, the actual video preview image is not ideal. Adidas Annual Report 2017: The adidas CEO video relies on short and fast key figure animations, which totally fit the brand image. The CEO is filmed from various perspectives and also in the form of close-ups, guaranteeing that users don’t lose attention. Triodos Bank Integrated Annual Report 2017: The video of Triodos Bank shows a mixture between personal interview and working environment, all of which seem very natural. Also, the message is very much to-the-point and there is an appealing teaser image plus short explanatory text, placed on the landing page. Unfortunately, the report itself, as well as the video, are not mobile-optimised. BASF Annual Report 2017: BASF provided one video per board member in their annual report 2017. The CEO video is only 1 minute long, very fast-moving and presents a mixture of direct speech, black & white footage and images, diverse perspectives and behind the scenes material in an interesting video style. This may not be for everyone, but it is worth watching. RBC Annual Report 2017: The CEO of the Royal Bank of Canada answers different questions in this interview-like video. Since the questions cannot be heard by the viewer, key words appear to introduce the topics discussed. The video is quite long but offers a variety of additional scenes accompanied by uplifting music. Capgemini Integrated Report 2017: The video shows the Capgemini Chairman and CEO in an (partly) virtual exchange with three other colleagues – a rather unusual video idea. Before watching the video, the moving teaser on the landing page is a really good eye-catcher that attracts the user’s attention. Virgin Atlantic Sustainability Report 2018: Again, direct speech plus lively video footage in this sustainability video of Virgin Atlantic. The sustainability results are summed up by the CEO with a reference to further videos on the topic. ERM Sustainability Report 2018: In terms of the message, the CEO of ERM talks about nterview situation, talks about the key issues and what sustainability today means for ERM.